This article is about the region of the U.S. For the college athletic conference, see Sun Belt Conference. For the region in Europe, see Golden Banana. The Sun Belt is a region of the United States generally considered to stretch across the Southeast and Southwest. Another rough definition of the region is the area south of the 36th parallel. 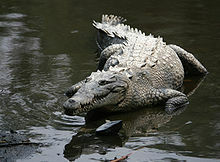 Within the region, desert/semi-desert (California, Nevada, Arizona, New Mexico, Utah, and Texas), Mediterranean (California), humid subtropical (Florida, Georgia, South Carolina, North Carolina, Texas, Louisiana, Mississippi, Alabama, Arkansas, and Tennessee), and tropical (South Florida) climates can be found. The Sun Belt has seen substantial population growth since the 1960s from an influx of people seeking a warm and sunny climate, a surge in retiring baby boomers, and growing economic opportunities. The advent of air conditioning created more comfortable summer conditions and allowed more manufacturing and industry to locate in the sunbelt. Since much of the construction in the sun belt is new or recent, housing styles and design are often modern and open. Recreational opportunities in the sun belt are often not tied strictly to one season, and many tourist and resort cities, such as Las Vegas, Los Angeles, Houston, Miami, Myrtle Beach, New Orleans, Orlando, Palm Springs, Phoenix, and San Diego support a tourist industry all year. 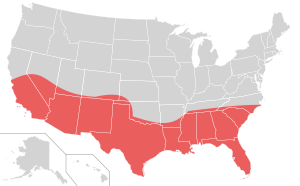 The Sun Belt comprises the southern tier of the United States, including the states of Alabama, Arizona, Florida, Georgia, Louisiana, Mississippi, New Mexico, South Carolina, Texas, roughly two-thirds of California (up to Greater Sacramento), and parts of North Carolina, Nevada, and Utah. Five of the states—Arizona, California, Florida, Nevada, and Texas—are sometimes collectively called the Sand States because of their abundance of beaches or deserts. First employed by political analyst Kevin Phillips in his 1969 book The Emerging Republican Majority, the term "Sun Belt" became synonymous with the southern third of the nation in the early 1970s. In this period, economic and political prominence shifted from the Midwest and Northeast to the South and West. Factors such as the warmer climate, the migration of workers from Mexico, and a boom in the agriculture industry allowed the southern third of the United States to grow economically. The climate spurred not only agricultural growth, but also the migration of many retirees to retirement communities in the region, especially in Florida and Arizona. Industries such as aerospace, defense, and oil boomed in the Sun Belt as companies took advantage of the low involvement of labor unions in the region (due to more recent industrialization, 1930s–1950s) and the proximity of military installations that were major consumers of their products. The oil industry helped propel states such as Texas and Louisiana forward, and tourism grew in Florida and Southern California. More recently, high tech and new economy industries have been major drivers of growth in California, Florida, Texas, and other parts of the Sun Belt. Texas and California rank among the top five states in the nation with the most Fortune 500 companies. In 2005, the U.S. Census Bureau projected that approximately 88% of the nation's population growth between 2000 and 2030 would occur in the Sun Belt. California, Texas, and Florida were each expected to add more than 12 million people during that time, which would make them by far the most populous states in America. Nevada, Arizona, Florida, and Texas were expected to be the fastest-growing states. Events leading up to and including the 2008–2009 recession led some to question whether growth projections for the Sun Belt had been overstated. The economic bubble that led to the recession appeared, to some observers, to have been more acute in the Sun Belt than other parts of the country. Additionally, the traditional lure of cheaper labor markets in the region compared with America's older industrial centers has been eroded by overseas outsourcing trends. One of the greatest threats facing the belt in the coming decades is water shortages. Communities in California are making plans to build multiple desalination plants to supply fresh water and avert near-term crises. Texas, Georgia, and Florida also face increasingly serious shortages because of their rapidly expanding populations. Lingering effects from the Great Recession slowed down, and in some places even stopped, the migration from the Frost Belt to the Sun Belt, according to data tracking people's movements over the year from July 2012 – 2013. Americans remained cautious about moving to a different state over this period. However, migration to the Sun Belt from the Frost Belt resumed again, according to 2015 Census data estimates, with growing migration to the Sun Belt and out of the Frost Belt and California. The environment in the belt is extremely valuable, not only to local and state governments, but to the federal government. Eight of the ten states have extremely high biodiversity (ranging from 3,800 to 6,700 species, not including marine life). The Sun Belt also has the highest number of distinct ecosystems: chaparral, deciduous, desert, grasslands, temperate rainforest, and tropical rainforest. The five largest metropolitan statistical areas are Los Angeles, Dallas, Houston, Miami, and Atlanta. The Los Angeles area is by far the largest, with over 13 million inhabitants as of 2012[update]. The ten largest metropolitan statistical areas are found in California, Texas, Georgia, North Carolina, Florida, and Arizona. Additionally, the cross-border metropolitan areas of San Diego-Tijuana and El Paso–Juárez lie partially within the Sun Belt. Seven of the ten largest cities in the United States are located in the Sun Belt: Los Angeles (2), Houston (4), Phoenix (6), San Antonio (7), San Diego (8), Dallas (9), and San Jose (10). ^ "State & County QuickFacts". US Census Bureau. Retrieved 2016-12-29. ^ "Los Angeles city, California - QuickFacts". US Census Bureau. Retrieved 2016-12-29. ^ Kaid Benfield. "Where Pittsburgh Has the Sun Belt Beat". CityLab. ^ Shayna M. Olesiuk and Kathy R. Kalser (27 April 2009). "The Sand States: Anatomy of a Perfect Housing-Market Storm" (pdf). FDIC.gov. Retrieved 10 May 2018. ^ Phillips, Kevin (2 April 2006). "How the GOP Became God's Own Party". Washington Post. Retrieved 5 September 2012. ^ "States with the most Fortune 500 companies". Fortune. 2015-06-15. Retrieved 2016-06-26. ^ Jotkin, Joel (March 28, 2016). "The Sun Belt Is Rising Again, New Census Numbers Show". Forbes. Retrieved December 28, 2016. ^ Frey, William H. (January 4, 2016). "Sun Belt Migration Reviving, New Census Data Show". The Brookings Institution. Retrieved December 28, 2016. ^ "Biodiversity in the United States (Map)". Archived from the original on 2011-01-26. Weinstein, Bernard L.; Robert E. Firestine (1978). Regional growth and decline in the United States: the rise of the Sunbelt and the decline of the Northeast. Praeger Publishers. ISBN 9780275239503. Hollander, Justin B. (2011). Sunburnt Cities: The Great Recession, Depopulation, and Urban Planning in the American Sunbelt. Taylor & Francis. ISBN 9780415592116.